At Heritage Conservatories we design and build quality made-to-measure hardwood conservatories for the UK market, specializing in work on listed buildings and period properties we are capable and happy to come up with solutions to the most awkward sites. Our eye for detail and the fact that each conservatory is individually designed from the ground up ensures that our clients can have exactly what they dreamed of rather than the closest compromise. The use of finest hardwood from sustainable sources and the use of the latest in glazing technology using Pilkington Low E glass, Pilkington antisun glass, and Pilkington Suncool HP where required make Heritage Hardwood Conservatories the ideal garden / leisure rooms for the discerning whatever your style of home, be it modern, a listed building or period property. All building work is compliant with the latest building regulations even when not required which ensures peace of mind (for us as well as our clients!) with every Heritage Conservatory. Heritage Hardwood Conservatories are available for construction in the UK within the region made up of Cambridgeshire, Essex, Hertfordshire, Suffolk and south Northamptonshire. Heritage Hardwood Orangeries are a style of leisure room which we have evolved in the UK at a tangent to the general concept of the word Orangery, with each Orangery designed specifically for the function the room is intended to fulfil and capable of blending in with the older fabric of a listed building. 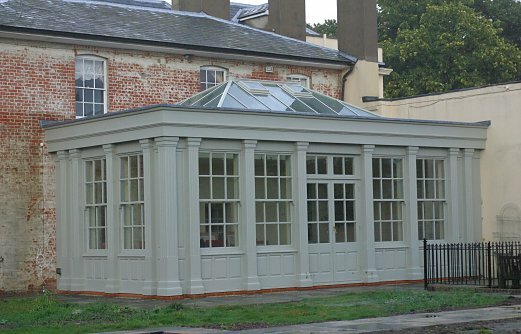 Heritage Orangeries are built using the latest building techniques and include a beautiful hardwood roof lantern in any colour you wish. Heritage Orangeries are available for construction within the region made up of Cambridgeshire, Essex, Hertfordshire, Suffolk and south Northamptonshire. A Heritage Garden Room is a leisure room with great benefits to those less attracted to the experience of a glass roof but still preferring a bright open addition. When considering a family extension it is common to just add more of the same type of space already available throughout the rest of the house. A Heritage Garden Room however makes a new addition an exciting prospect specifically designed to suit your needs whether the space is to be used as a kitchen extension, dining room, family room, study, games room, whatever! Heritage Garden Rooms are available for construction in the UK within the region made up of Cambridgeshire, Essex, Hertfordshire, Suffolk and south Northamptonshire.